10.17.2012: Kodoja attacks the Kaijucast! 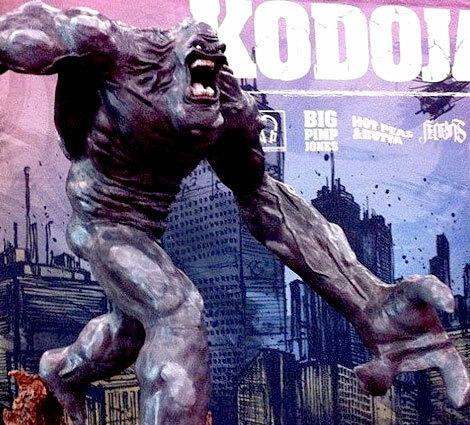 The Kodoja statue at New York City Comic Con! Episode 67 is here and we are talking with Keith Foster of the funk sensation Big Pimp Jones about their latest multimedia excursion, Kodoja: Terror Mountain Showdown. I had the pleasure of meeting Keith this summer in San Francisco and I really love/appreciate what he and his crew are doing. Kodoja is an album, a comic and an ongoing story about a giant monster running amok… what’s not to love? In addition to promoting the current release, I wanted to showcase the kickstarter project that is currently underway. So far their entire production has been financed out of pocket and they need your help to get the next issue to the printer! Pledge today to help the Kodoja Kickstarter! *Don’t forget to check out GeekPortland.com for ALL of the local nerdery happening here! Because this month contains my favorite holiday (Halloween – and I’m sure I’m not alone) and I have a TON of work to do on my costume, we have a shortened schedule for the Daikaiju Discussion. 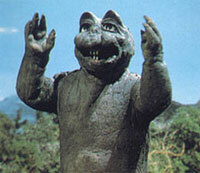 You only have a few more days to send in your thoughts, questions & reviews for Son Of Godzilla! We’ll be watching the dubbed International DVD from Sony. Just make sure that if you want to participate, you get that “homework” mailed in by the 22nd to have your contributions added to the next episode!